This might be the most high protein recipe I've ever made! (See the nutrition info at the bottom). I never knew a lettuce wrap could be so filling. This recipe makes enough for 4-6 people, but if it's just you, you can store the leftover seitan in the fridge or freezer and get multiple meals out of it. The seitan is inspired by the lemon-olive seitan from the book Vegan Eats World by Terry Hope Romero. Terry makes the best seitans in my opinion. I just changed a few things to make it lower carb. I usually make a double or even triple batch of this stuff because it goes well with all kinds of meals, from low carb vegan 'meat and potatoes' to sandwiches, salads, and lc pasta pesto. In a large bowl mix the gluten, soy flour, nutritional yeast, herbs and salt. Add the broth, lemon juice, olive oil, olives and garlic and mix everything well. Knead the mixture with your hands for a minute until it forms a wet ball of dough. Divide the dough into four equal pieces. Bring water to a boil in a steamer pot. Tear off four wide pieces of aluminum foil. Put a piece of dough on a piece of foil and shape it into a rectangular log. Loosely wrap the foil around the log and fold it closed at the top so no water can get in. Put the foil packets in the steamer basket (this can also be a colander suspended in a regular pot). Put the lid on and steam the seitan four 35 minutes. Take the seitan pieces out of the steamer and let them cool inside the foil. They are now ready to use. Unwrap and store them in a sealed container in the fridge or freezer. Cut the seitan into strips, like gyros. Preheat a glug of oil in a large skillet on medium high heat and sauté the seitan strips until they are golden brown on all sides. Do ths in batches if it doen't all fit in your skillet at once. In the mean time make the garlic sauce by mixing all the ingredients (yogurt to dill) in a bowl. 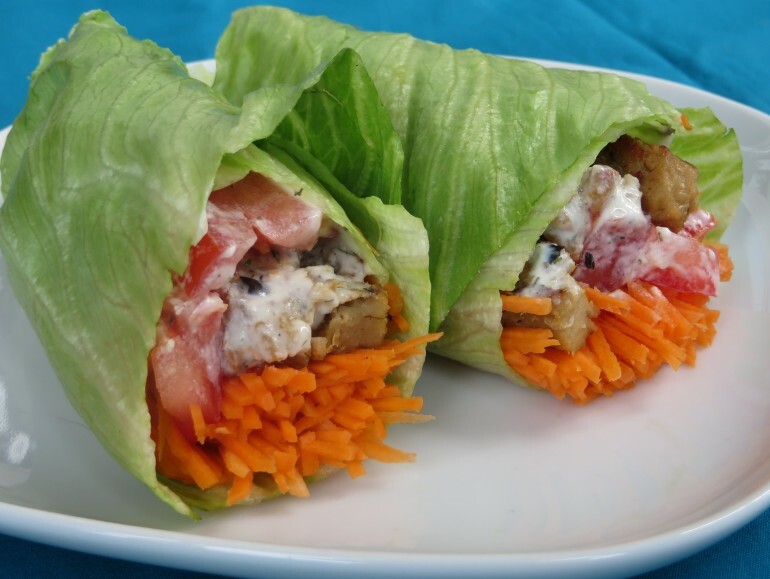 Take a lettuce leaf and put a handful of carrot, and a few tomato cubed on it. Pour on half a tablespoon of the sauce. Fold one side of the lettuce lead over the filling and roll it into a closed wrap. Repeat with the remaining leaves, filling and sauce. Three wraps with filling contain about 490 kcal, 23 g fat (2 g saturated), 23 g carbohydrate, 9 g fiber en 50 g protein. Great recipe! Do you know the macros on just the setain? Hi Michelle, sorry I don't have those calculated separately.